Shildon AFC had a very comfortable 6 – 0 away win at relegated Celtic Nation on Saturday 18th April 2015. If was one way traffic from the kick off with Mark Doninger opening the scoring on 16 minutes with a long range drive from outside the box. Ten minutes later a great four man move was finished off in style by Billy Greulich-Smith whose shot rocketed into the roof of the net. Just 3 minutes later Mark Doninger scored the goal of the day, maybe the goal of the season with a brilliant overhead scissor kick, giving keeper Andrew Casson no chance. Just before the break Chris Emms put Ben Wood through and he poked the ball past keeper Casson. Early in the 2nd half Mark Doninger fired over the bar, before Daniel Moore was brought down in the box, but the ref. waived play on. Celtic were a better team after the break with Lewis Graham saving from No 9 Simon Tucker. 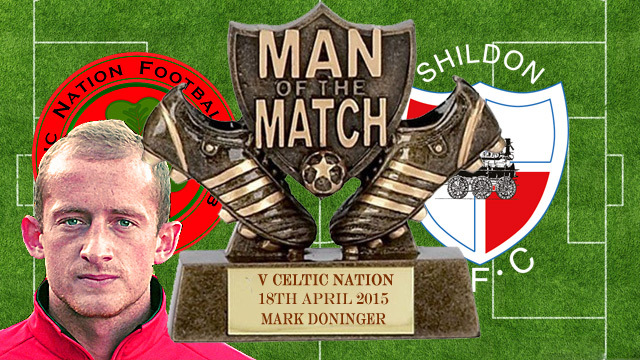 On 72 minutes Mark Doninger got his hat-trick when Jason Blackburn put his through and he beat the advancing keeper. Celtic were becoming frustrated and resorted to committing far too many fouls with 5 players receiving yellow cards. On 81 minutes Celtic’s Shaun Dixon brought Adam Rundle down in the box for a penalty which Rundle converted with ease for 6 – 0. Goalscorers: Doninger 16, 29, 72, Greulich-Smith 26, Wood 40, Rundle 81. Subs: Rundle for Wood 40, Blackburn for Greulich-Smith 62, Chapman for Brackstone 74. After the match manager Gary Forrest said “We came here and did what we had to do, that is win the game. If we can win our last 3 games then we will win the league, but we cannot afford any slip ups”.